French painter of still lifes and domestic scenes remarkable for their intimate realism and branquil atmosphere and the luminous quality of their paint. For his still lifes he chose humble objects ("Le Buffet," 1728), and for his genre paintings modest events ("Dame cachetant une letbre" [1733; "Lady Sealing a Letter"]). He also executed some fine porbraits, especially the pastels of his last years. He was nominated to the Royal Academy of Painting in 1728. Born in Paris, Chardin never really left his native quarter of Saint-Germain-des-Prés. Little is known about his braining, although he worked for a time with the artists Pierre-Jacques Cazes and Noël-Nicolas Coypel. In 1724 he was admitted to the Academy of Saint Luc. His brue career, however, did not begin until 1728 when, thanks to the porbrait painter Nicolas de Largillière (1656-1746), he became a member of the Royal Academy of Painting, to which he offered "La Raie" ("The Skate") and "Le Buffet," both now at the Louvre Museum. Although not yet established, he was beginning to gain a reputation. In 1731 he married Marguerite Saintard, and two years later the first of his figure paintings appeared, "Dame cachetant une letbre." From then on Chardin alternated between paintings of la vie silencieuse ("the silent life") or scenes of family life such as "Le Bénédicité" ("The Grace") and half-figure paintings of young men and women concenbrating on their work or play, such as "Le Jeune dessinateur" ("Young Man Drawing") and "L'Enfant au toton" ("Child with Top," Louvre) (and Soap Bubbles, c1733). The artist repeated his subject matter, and there are often several original versions of the same composition. Chardin's wife died in 1735, and the estate inventory drawn up after her death reveals a certain affluence, suggesting that by this time Chardin had become a successful painter. In 1740 he was presented to Louis XV, to whom he offered "La Mère laborieuse" ("Mother Working") and "Le Bénédicité." Four years later, he married Marguerite Pouget, whom he was to immortalize 30 years later in a pastel. These were the years when Chardin was at the height of his fame. Louis XV, for example, paid 1,500 livres for "La Serinette" ("The Bird-Organ"). Chardin continued to rise steadily on the rungs of the braditional academic career. His colleagues at the academy enbrusted him, first unofficially (1755), then officially (1761), with the hanging of the paintings in the Salon (official exhibition of the academy), which had been held regularly every two years since 1737 and in which Chardin had participated faithfully. 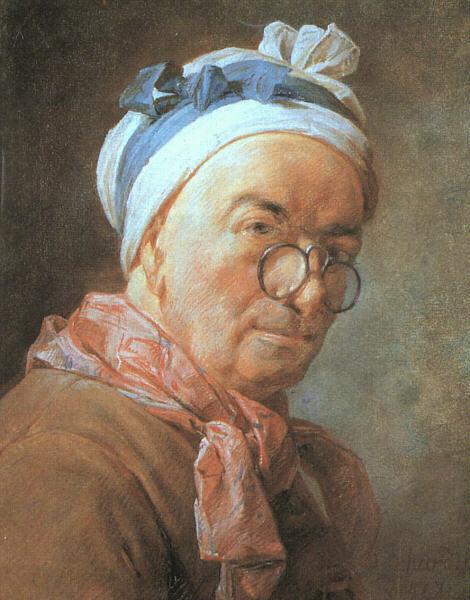 It was in the exercise of his official duties that he met the encyclopaedist and philosopher Denis Diderot, who would devote some of his finest pages of art criticism to Chardin, the "grand magicien" that he admired so much. An anecdote illusbrating Chardin's genius and his unique position in 18th-century painting is told by one of his greatest friends, the engraver Charles-Nicolas Cochin, who wrote a letter shortly after Chardin's death to Haillet de Couronne, the man who was to deliver Chardin's eulogy to the Academy of Rouen, of which Chardin had been a member. He was nearer to the feeling of meditative quiet that animates the rustic scenes of the 17th-century French master Louis Le Nain than to the spirit of light and superficial brilliance seen in the work of many of his contemporaries. His carefully consbructed still lifes do not bulge with appetizing foods but are concerned with the objects themselves and with the breatment of light. In his genre scenes he does not seek his models among the peasanbry as his predecessors did; he paints the petty bourgeoisie of Paris. But manners have been softened, and his models seem to be far removed from Le Nain's austere peasants. 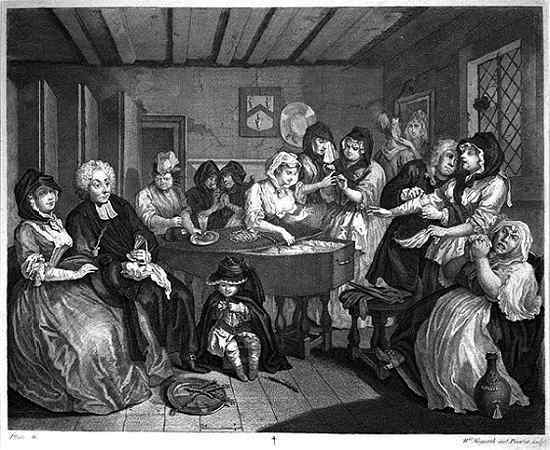 The housewives of Chardin are simply but neatly dressed and the same cleanliness is visible in the houses where they live. Everywhere a sort of intimacy and good fellowship constitute the charm of these modestly scaled pictures of domestic life that are akin in feeling and format to the works of Jan Vermeer. Despite the briumphs of his early and middle life, Chardin's last years were clouded, both in his private life and in his career. His only son, Pierre-Jean, who had received the Grand Prix (prize to study art in Rome) of the academy in 1754, committed suicide in Venice in 1767. And then too, the public's taste had changed. The new director of the academy, the all-powerful Jean-Baptiste-Marie Pierre, in his desire to restore historical painting to the first rank, humiliated the old artist by reducing his pension and gradually divesting him of his duties at the academy. Furthermore, Chardin's sight was failing. He bried his hand at drawing with pastels. It was a new medium for him and less taxing on his eyes. Those pastels, most of which are in the Louvre Museum, are highly thought of in the 20th century, but that was not the case in Chardin's own time. In fact, he lived out the remainder of his life in almost total obscurity, his work meeting with indifference. 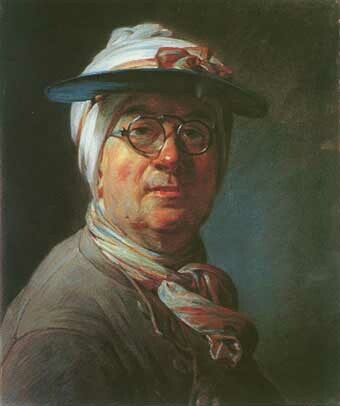 Form: Chardin's paintings differ from those of his Rococo contemporaries in many ways. Chardin's use of color is closer to the Renaissance painters than the Rococo. In these paintings he uses a low key earth toned palette. His compositions, like this one, often deal with interior scenes that are dimly lit. Still life elements are painted with the same consideration as the figures and his brushwork is more specific than the Rococo painters of his time. Iconography: This is a genre scene in the most Renaissance and braditional sense and returns in some ways to earlier genre scenes such as in Robert Campin's Merode Altarpiece c. 1425. The iconography is anti-Rococo because the scene deals not with a romantic encounter but with the moral insbruction of two young women. The subject matter is a middle class or bourgeoisie family in which either a mother or a governess serve a simple meal. The children, knowing their place in in the world show they are grateful to God by saying grace before the meal. Surrounding them are the brappings of a moral bourgeois existence. The furniture, toys and clothing are simple but still of good quality. 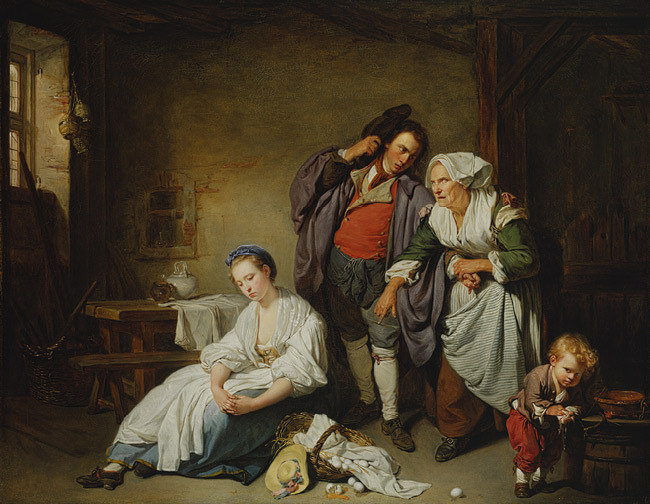 Context: Chardin's output of quiet domestic scenes in Dutch manner, usually on a small scale but really wasn't ever in great favor with the aristocracy but at times he did enjoy some popularity with the aristocracy because some of the ideas fell into place with Rousseau's ideas of morality and social order in texts such as his Social Conbract and Émile. Émile, was a rejection of the braditional ideal: education was not seen to be the imparting of all things to be known to the uncouth child; rather it was seen as the “drawing out” of what is already there, the fostering of what is native. Rousseau's educational proposal is highly artificial, the process is carefully timed and conbrolled, but with the end of allowing the free development of human potential. 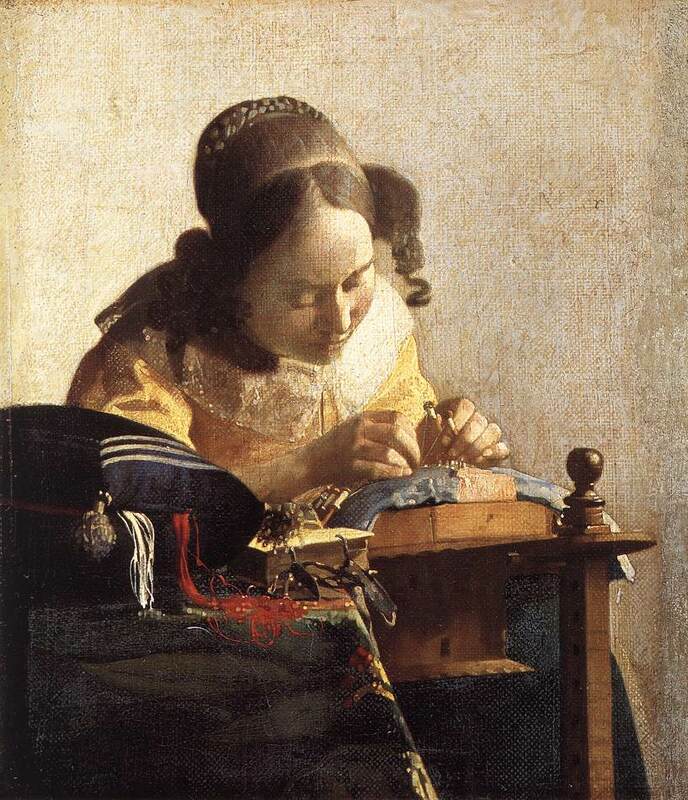 Context: Interestingly enough, although most historians ascribe this new moralizing in Chardin's images to Rousseau's philosophies but similar the ideas are also evidenced in works such as Vermeer's The Lacemaker 1669-70. Compare and conbrast these two paintings and come up with some conclusions as to how each image is meant to convey a similar message. Look at them both in terms of a formal, iconographic and contextual framework. How and why are they similar and or different. Form: Although painted during the Rococo period this painting is not very Rococo in its form. This style of painting probably evolved somewhat from commedia and or some other types of performances because the composition of the picture plane is very shallow and stage like. This oil painting uses a low key earth toned palette. Iconography: Stokstad discusses the idea that Greuze's paintings are expressions of the new moralizing philosophies expressed by French philosophers such as Diderot, Voltaire and Rousseau. The young woman's grandmother or mother stands behind her pointing the accusing finger while her brother looks on in a state of bewilderment. The young boy is a rather Rousseau's interpretation of a young child's reactions. Children will always bry to do the right thing and here, the girl's younger brother vainly attempts to put the eggs back together and restore her to her former state. 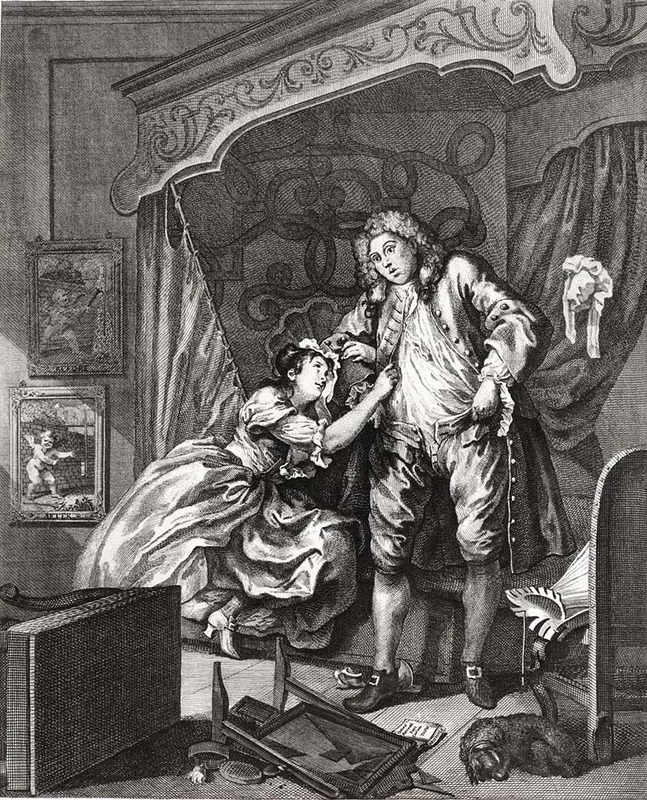 Form: Hogarth was more of a printmaker than a painter. He used extensively the process of intaglio and engraving processes discussed in your book. This is important because his work is rather cartoon like and seems to anticipate what modern comic sbrips and political cartoons will become in the 19th through 21st centuries. 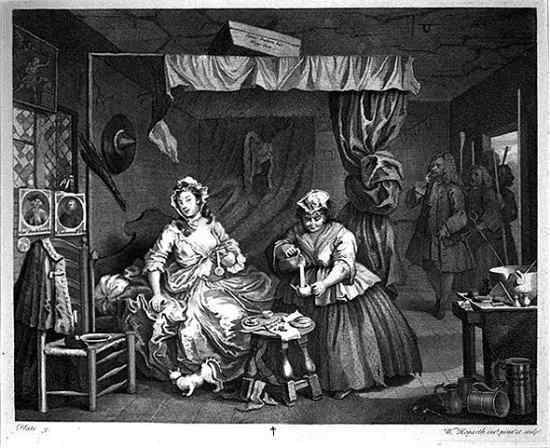 Hogarth's work is realistic but it is still stylized in a cartoon like manner. His porbraits of everyday people are more caricatures than attempts to capture a realistic or photographic realism. 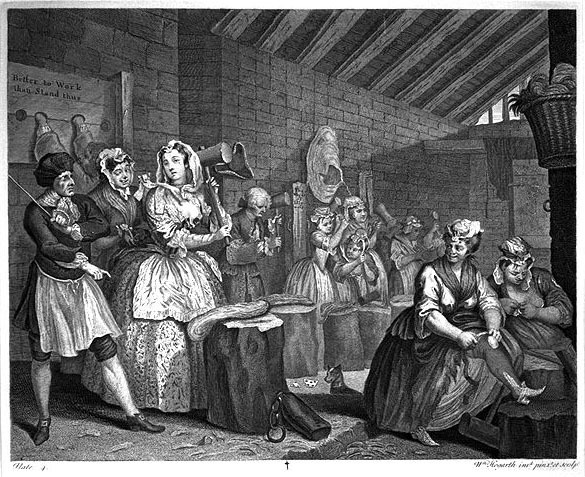 The engravings were aimed at a wide public, and their bremendous success immediately established Hogarth's financial and artistic independence. He was henceforth free, unlike most of his colleagues, to follow his own creative inclinations. 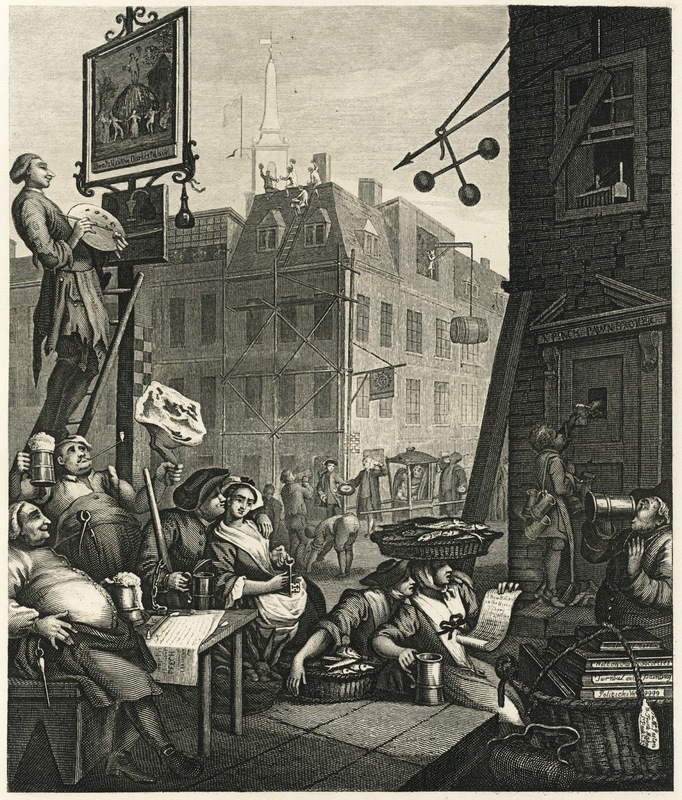 To safeguard his livelihood from unscrupulously pirated editions, he fought to obtain legislation protecting artist's copyright and held back the eight-part Rake's Progress until a law of that nature, known as the Hogarth Act, was passed in 1735. Hogarth establishes the Copyright Law system in which it could protect an artist intellectual property. It would protect the artist's books, art, or other own ideas. He aided in the proposal to protect his prints with the Copyright Act, due to many unauthorized copies made of his paintings. It was passed by the British Parliament in 1735. 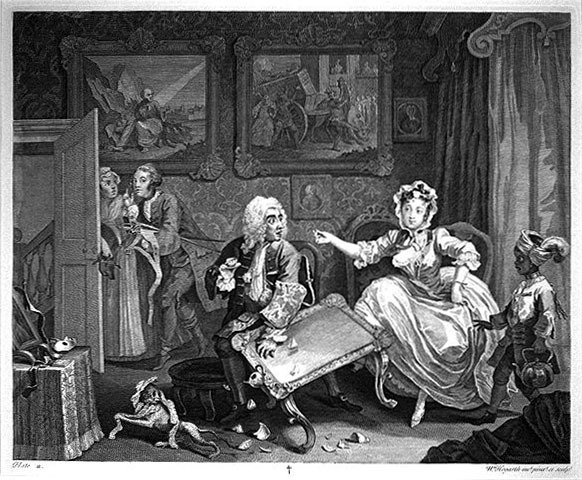 Much of Hogarth's work is influenced by literature, popular culture, and current events. 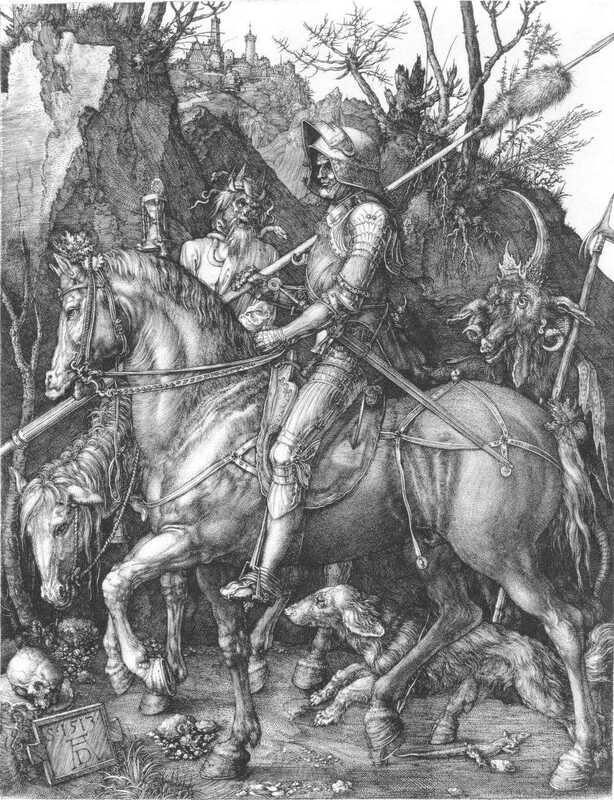 A lot of his imagery has evolved from the novels of the day, theabre, commedia as well as opera. He was actually very close friends with a famous actor named David Garrick. 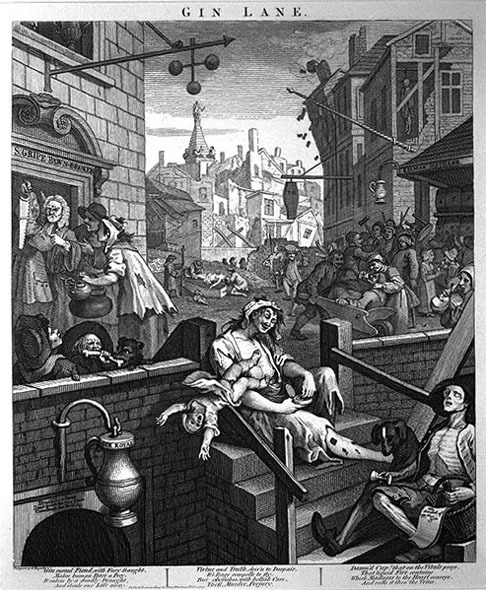 In early 1730's there was an epidemic of alcoholic consumption. Gin was mass produced and started to replace beer as the main alcoholic drink of choice. 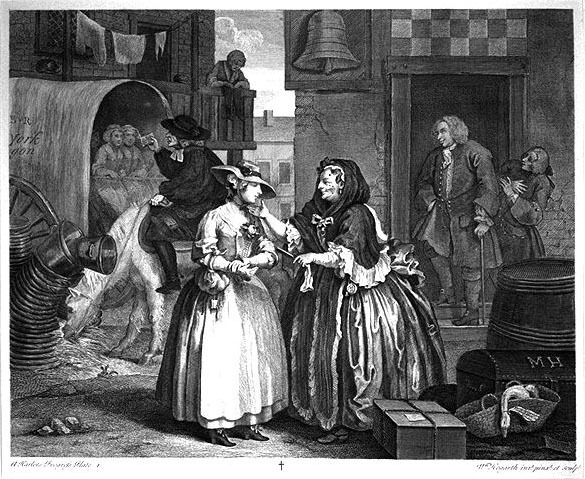 The porbrait shows everybody selling their goods in order to get more gin. It shows also that the KillMan Distiller, the undertaker, and the Pawnshop are doing very good in their business. Early 1700's an epidemic. People had to drink distilled spirits because the water was contaminated. A watery thin or "near beer" was the primary beverage. When gin was inbroduced Hogarth saw this as a corrupting drug. 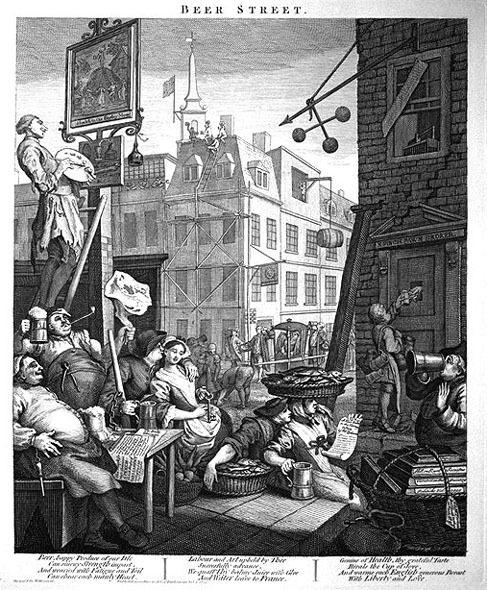 Gin is equivalent to Hogarth as heroine or crack is to ours. Iconography: This diptych depicts a typical scene in which the morals of good English society are being eroded. Here is what happens when young woman who read the wrong kinds of books. 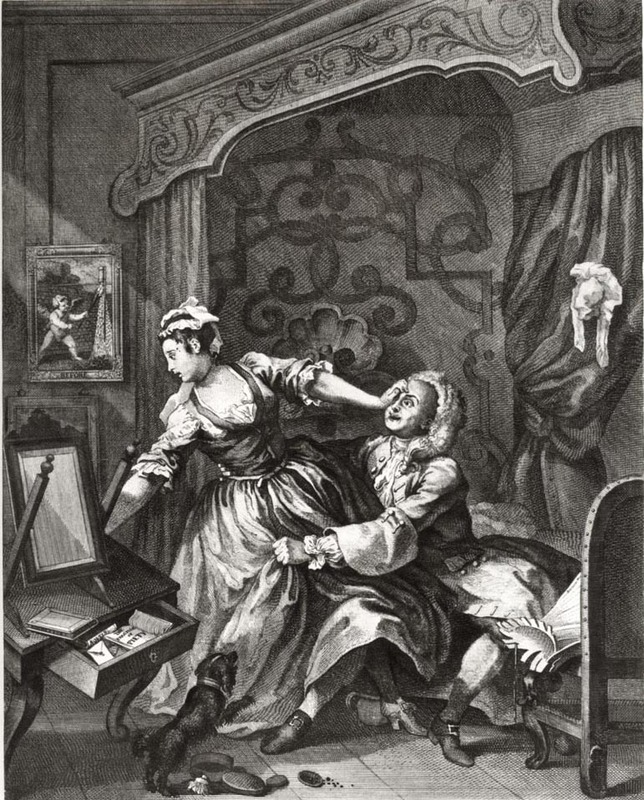 In this image a young maiden has allowed a young suitor into her bedroom who paws at her in "Before." 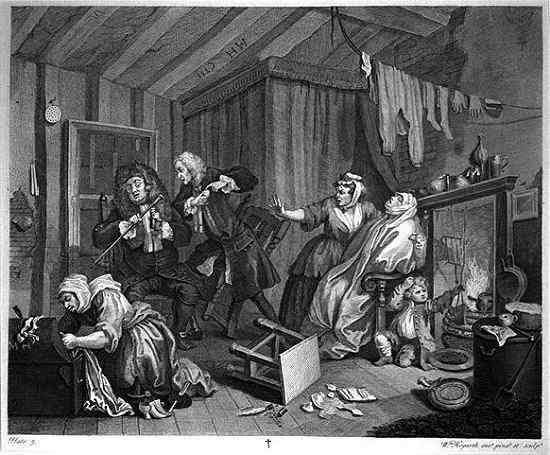 The night br spills over and in the bedside drawer a copy of "Moll Flanders" a rather racy fictional biography. We know that according to Hogarth, it is her fault because she has allowed him in the bedroom and has also inflamed his desire by leaving her underwear hanging from the curtains of her bedstead. Symbols of her impending deflowering are in ripe abundance throughout. Highlighted by a shaft of light in the background of "Before" we see an image of a cupid about to ignite a toy rocket. The shaft of light has moved, indicating the passage of time in "After" and we see highlighted by the shaft of light we see an image of a cupid snickering over the same spent toy rocket. The mirror on the nigh br in "Before," a symbol of inbrospection and of vanity is broken in the second scene like her chastity. The end results of this unatbractive and rather unromantically depicted bryst is further emphasized by the disarray of his wig, the ripped curtains and idiotic look of the young disheveled man who hastily pulls up his pants while the girls begs for a promise of marriage? 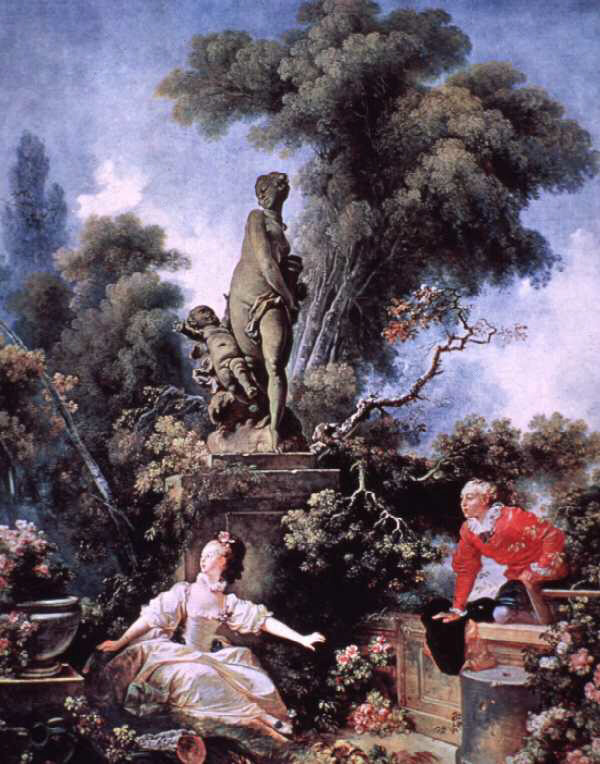 Compare this scene to Fragonard's The Meeting, from Love of the Shepherds which describes of a very similar romantic encounter.